A grass trimmer can be one of the most useful lawn tools you own. They are great for cutting grass in areas that a mower cannot get to, they can work to remove weeds, and they can also be useful for edging. While electric and battery powered weed wackers can be convenient for shaping up your lawn, you do need to make sure to use the machine properly. Following some of the best practices can improve the safety of operating a grass trimmer, and it can also help you to avoid damaging your lawn or plants that you may use the machine near. Here is a quick guide for people who are planning to use an electric or battery powered string trimmer this spring. First, choose the grass trimmer that suits your needs best. Then, learn how to use it by angling the head appropriately and moving the trimmer in the right direction. Finally, adjust this technique appropriately for using the weedwacker on tall grass, edging, or trimming between concrete. Many people might assume that all electric or battery powered string trimmers are the same, but there are different types. One of the first things to consider is whether you want to use a grass trimmer/edger with a curved shaft or one with a straight shaft. The curved shaft tends to be better for light work like cutting weeds around the garden or touching up grass around trees. If you have obstacles like fences and bushes that you need to get under, a straight shaft is probably the way to go. Power source is another consideration. If you have a large area that is going to need to be trimmed, most people would recommend a gas-powered weed wacker. However, a weed wacker/lawn mower combo like the Worx GT Revolution 20V 12″ 4.0 Ah String Trimmer/Edger/Mini-Mower is probably the best option for most homes. For grass trimmers, you also have to consider the difference between cordless and corded electric grass trimmers. An electric grass trimmer that uses a cord will be able to cut for longer, but it is going to limit your range. A cordless battery powered weed wacker, meanwhile, is going to offer more freedom to move around. However, there is the possibility of the charge on a battery powered string trimmer running out. If you go with a corded weed wacker, you need to consider the cord length. If you buy a cordless grass trimmer, you need to think about the battery time and whether it comes with a spare battery. When it comes to basic grass trimming, there are two things you need to understand: the direction you should work in and the angle of the trimmer. Most electric and battery powered string trimmers spin the head counterclockwise. For this reason, you want to move the head in a right to left motion when trimming. If you happen to have a machine that spins clockwise, then you would want to go left to right. As for the angle, you do not want to bring the trimmer down flat. You want to angle the head of the grass trimmer so the front edge of the string cuts the grass. If you need to cut tall grass or weeds, you want to start at the top and work your way down to the base. Move the grass trimmer in short strokes in and out of the work zone and overlap the strokes until you get the grass or weeds down to the desired height. You can also use an electric or battery powered string trimmer to do edge work around things like patios, walkways and driveways. With a standard grass trimmer/edger, this would mean turning the machine so the string goes vertical. You can then just walk it down the edge of the surface you are working near. If you want to make edging and mowing easy, you could look for a weed wacker/lawn mower that has an adjustable head for edging. 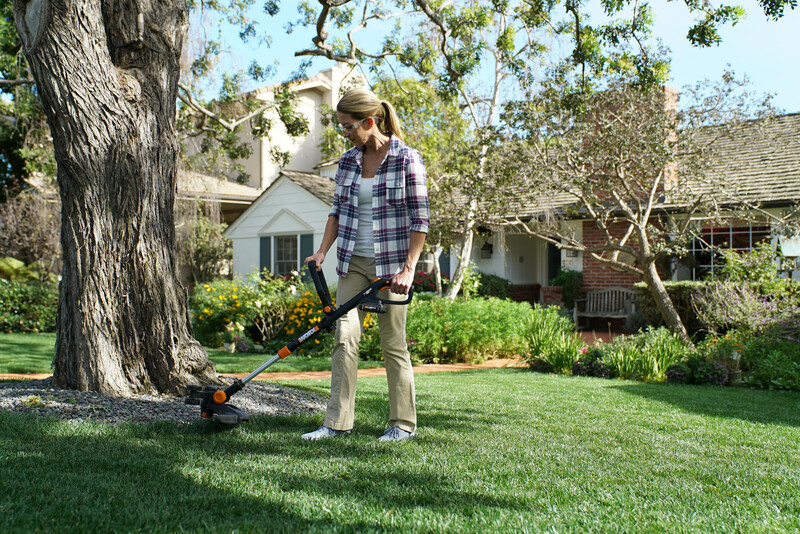 A good example is the GT Revolution 20V cordless string trimmer/edger from Worx. You can also use an electric or battery powered weed wacker for eating up weeds that are growing up through cracks in sidewalks and driveways. The trick here is to angle the tool so the string is just barely coming into contact with the concrete. Once you have it angled, you can then move the string into the base of the weed and cut it flush with the surface. Choose the grass trimmer that suits your needs best. Learn how to use it by angling the head appropriately and moving the trimmer in the right direction. Adjust this technique appropriately for using the weedwacker on tall grass, edging, or trimming between concrete.